Wherever you are, be sure to take along at least one of our eye-catching Seersucker Blouses with 3/4 sleeves, V-neck collar, and a slightly rounded hemline. The color Blue Jean has snaps down the front, and the other colors have buttons down the front. Vibrant and subtle colors in distinctive and popular cotton seersucker, it will be the perfect cool top for your tropical vacation this winter. Very generous sizing, S, M, L, XL. See size details in Size Selections. Falls to mid-hip length. 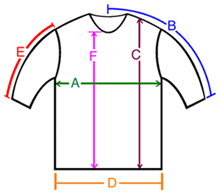 A: Chest / Bust circumference 43-44" 47-48" 51-52" 55-56"
B: Sleeve length from center of neck to end of sleeve 24.5" 25" 27" 27"
C: Body length from shoulder to bottom of hem 26.5" 26.5" 27.5" 29"
D: Hem circumference 45" 48" 56" 59"
E: Sleeve length from shoulder to end of sleeve 16" 16" 17" 17"
F: From the bottom of the V-Neck to hem 20.5" 20.5" 21" 22"
Whoever created this one deserves a gold star. On warm days, which we have often, these blouses are what I reach for. They look special and go with any pant in my closet. I'm happy! Thanks. Comfy shirt. Generous fit, so order down a size. Very flattering.